I saw this Pin last fall and wanted to make it so bad. 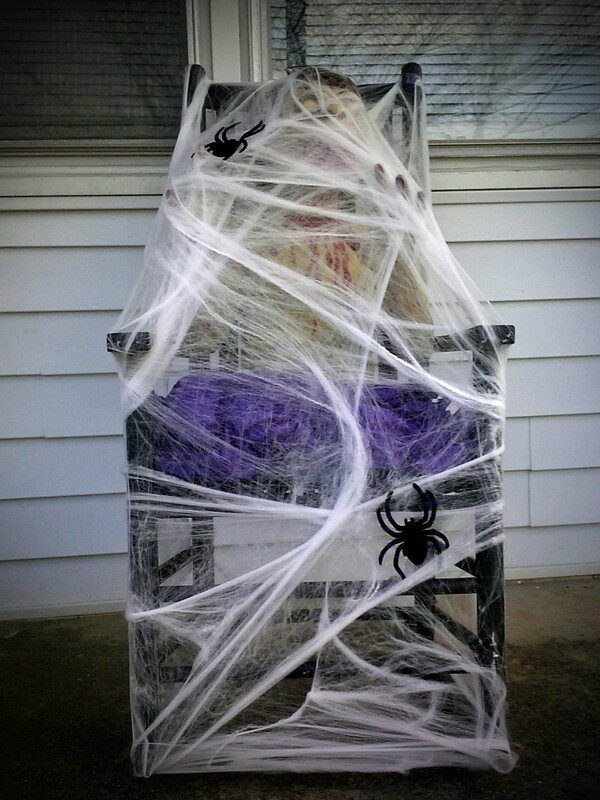 Who wouldn’t want a person trapped in a spider web in their front yard? It wouldn’t be too scary for the neighborhood kids plus it looked so awesome. With the tree I have in my front yard it would be tricky. The branches start close to the ground on my tree making getting close to the trunk difficult. I felt with some strategic moves on my part it could be done. Picture from Pinterest. Link below. Sadly my work schedule picked up causing me to work a whole lot of overtime. 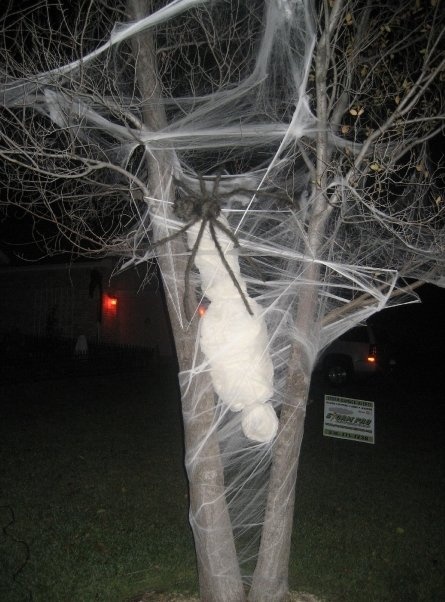 I still found time to decorate for Halloween, just not as much as I wanted to. I was able to accomplish one Pin. I will share that at a later date. The hubby immediently piped up. “we’ll take one.” he said. Now we have the twins. Vincent and Boris, our evil boys. FYI: the switch wasn’t broke. On/off writing was reversed. The boys work just fine. Vincent is always popping up at the most unexpected places and scaring the crap out of me. The hubby is always moving Vincent around the house when I’m not looking. I hope it’s the hubby doing it anyway. 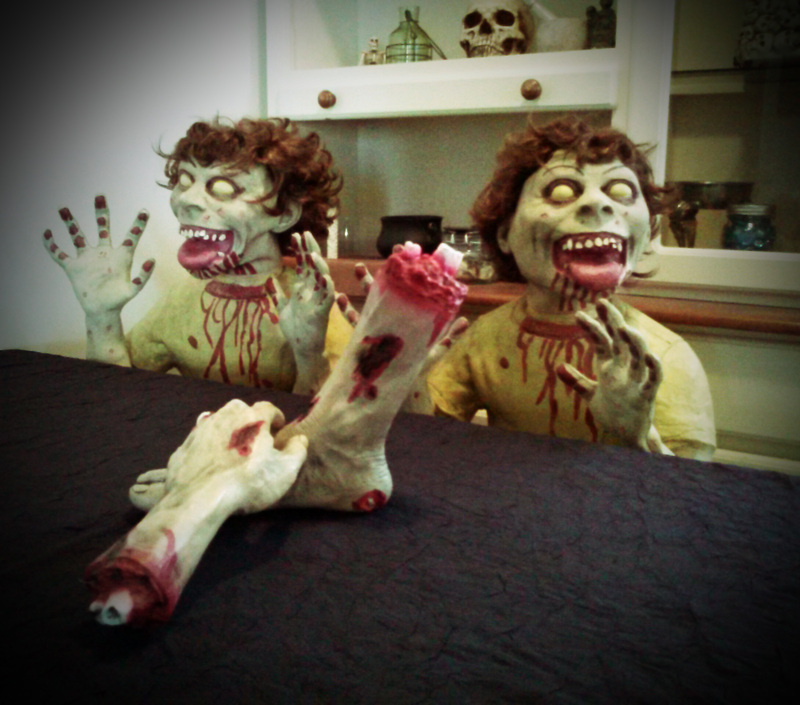 While getting the twins ready to be in our Halloween display I had an idea. I can stop both Vincent and my hubby dead in their tracks. Vincent was placed in the ‘time-out’ chair. With the help of some spider webbing, a few thumb tacks and some tape Vincent became a prisoner of the time-out chair. Boris sat on the back porch with a bowl of body parts on his lap. It wasn’t a spider victim trapped in a tree web but I was happy. Next Halloween there will be one in the tree just like the Pin. Even if I have to use a real body. Until next time remember: You can pin if you want to. You can leave your friends behind. Cause if your friends don’t pin and if they don’t pin. Well they’re no friends of mine. Now that you have that little ’Men Without Hats’ tune stuck in your head my job is done. Gotha…out.